Box no 32 : the-S box February 2019 is focused on fabric with a lighthearted collection of slightly whimsical cotton prints. This gorgeous box should be called fur, feathers and fluff after the hares, birds and sheep it features! APOLOGIES : some of the leaflets enclosed in the-S box February 2019 have been incorrectly printed and contain an error wrongly stating the size of the fat quarters as 50cms x 110cms. Each fat quarter is actually half this amount measuring approx 50cms x 55cms !!! 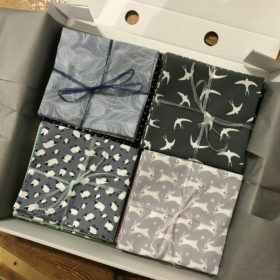 Warning – we only ever make a limited batch of each gorgeous box ..order soon before they disappear…If you want to take out a rolling monthly subscription to the-S box without having to commit to a big stash of cash up front, visit uOpen.com and grab a guaranteed the-S box each month for £19.90 including postage.